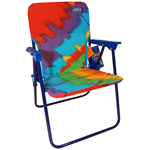 Our childrens beach chair is great for the beach or just extra seating. It features a safety lock for your child protection. 10" off ground. 1 1/2 - 4 yrs. Up to 50 lbs. Colors and styles may vary.